• Severe crushing of the fingertip: If just skin is removed from the fingertip or if there is just a little bit of bone exposed at the fingertip, this injury can be treated with a simple dressing. If the injury is more serious, surgery may be needed. 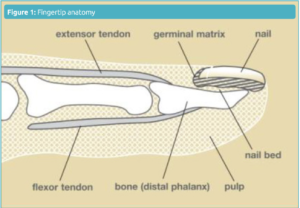 • Broken finger bone: This is very common. This can be treated with a splint or temporary metal pins to hold the bone fragments in proper position. If the damage is too severe, amputation of the fingertip may be necessary. • Injured nail bed: If blood is collecting under the nail, it may be drained by making a small hole in the nail. If the nail bed is more seriously injured, you may need a splint or even surgery. Your finger may be sensitive for many months. Sometimes, you’ll have limited feeling in the fingertip. The quality and texture of the skin may be di erent, and your finger will likely look different.